Note: This plugin is discontinued due to the fact that digg buttons no longer exist, since Summer of 2012.
diggZ-Et is a digg WordPress plugin that automatically displays a “digg” button for each post/page. I know some of you are thinking, “Oh great another Digg It plugin?”. Well yes, it’s another Digg It plugin, but it’s not the same old Digg plugin. This plugin was created primarily for one reason, that every other Digg WordPress plugin out there did not contain admin settings. Well guess what, this plugin does have admin settings! Enjoy the plugin, more plugins to come in the future. Set Skin Type – Choose from the Default, Compact and Icon Skins. 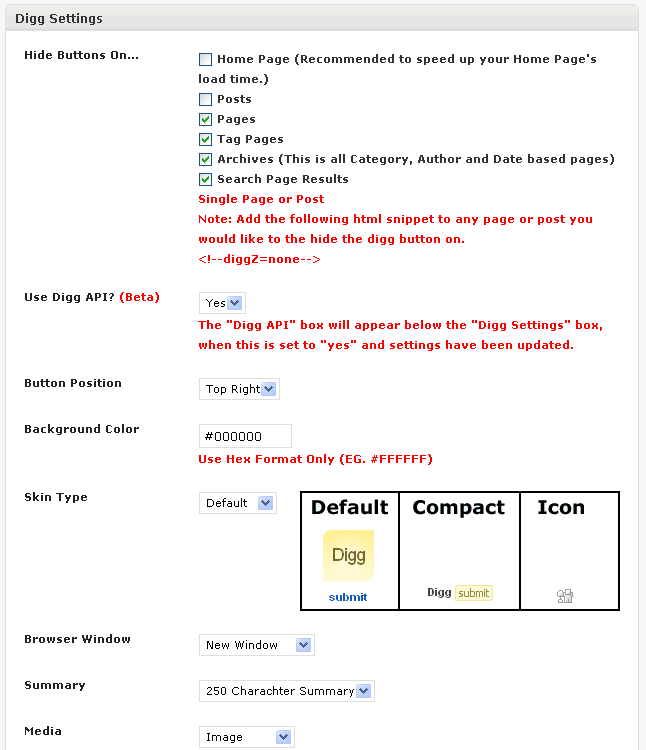 Browser Window Setting – Choose if you want the digg link to load in same window or a new window. Manual Button Placement – Use shortcode to manually place your buttons. Media Scan – Use multiple types of media. Report bugs or request a new feature for diggZ-Et via our feedback forum. * Fixed a bug causing API buttons to sometimes not display an inacurate amount or no diggs at all. * Fixed the incorrect submission link bug for API Buttons. * Changed the way bottom positioning is handled. * Anyone upgrading will need to reset their settings due to the code changes (This is in preparation to add in the digg API in a future release). * Fixed a bug where auto summaries were not removing block code correctly. * Fixed a bug where newline text in auto summary broke buttons. * Can now choose the max number of characters for auto summary; 150, 250, 350. * Fixed IE6 bottom positioning issue. * Added preview image for all 3 digg skins in admin. * Fixed promote option so it only shows the promotion links on pages and posts. * Fixed some CSS issues involving bottom button alignment. * Fixed an issue where tags were not being removed correctly from Automatic Summaries. Thanks goes out to Christian Riesen for this fix. 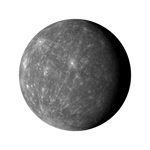 * Fixed URL encoding issues with Automatic Summaries. * Promotion link option added to admin (Thanks goes out to those that help support diggZ-Et). 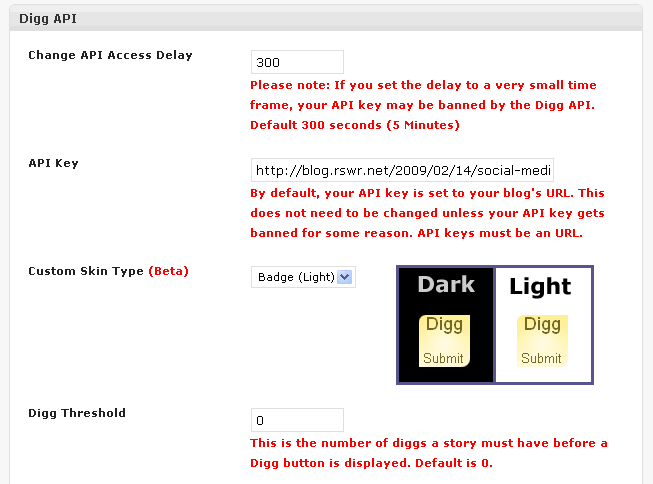 * Can now hide a Digg button on a single page or post. See F.A.Q. for more information. * Button Positions Reworked – Display Digg Button at top left or right or bottom below text, left or right. * New Media Scan See F.A.Q. for more information. * Bug Fix: Fixed an issue with shortcode becoming broken when used in a post.